Potatoes – 4 (small sized) – First wash the potatoes really well. Then cut them into medium sized pieces and put into a water to avoid discoloring. If you don’t like to keep skin on, you can peel them before cutting. 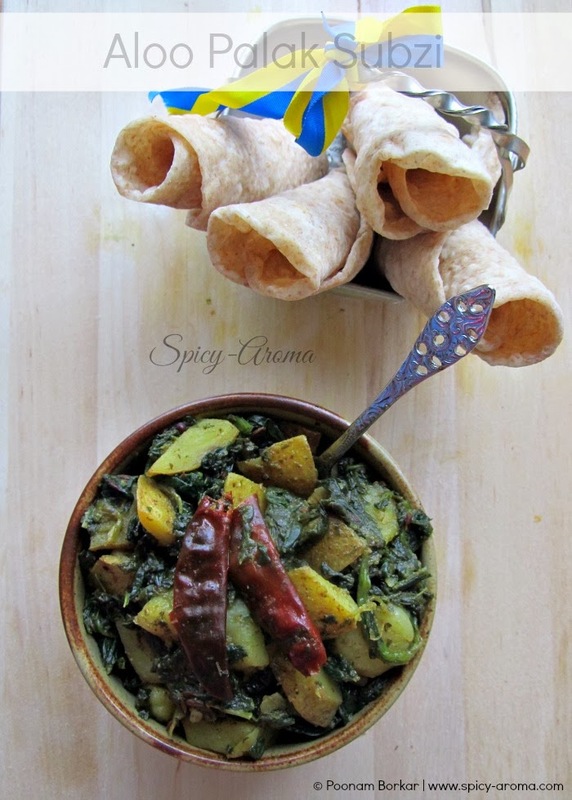 How to make Aloo palak ki sukhi subzi? In heated oil, add mustard seeds, cumin seeds, dried red chillies and asafoetida. Let the seeds splutter nicely. Then add potatoes, turmeric powder and salt to taste. Mix well and cook covered on medium heat until potatoes are half cooked, stirring occasionally. Add a splash of water if necessary to prevent sticking of potatoes to the bottom of pan. Meanwhile dry roast kasoori methi in another pan. This way you can powder it easily. Roasting is optional, you may add as it is. Then add crushed kasoori methi along with all dry spices (red chilli powder, cumin powder, coriander powder and amchoor powder). 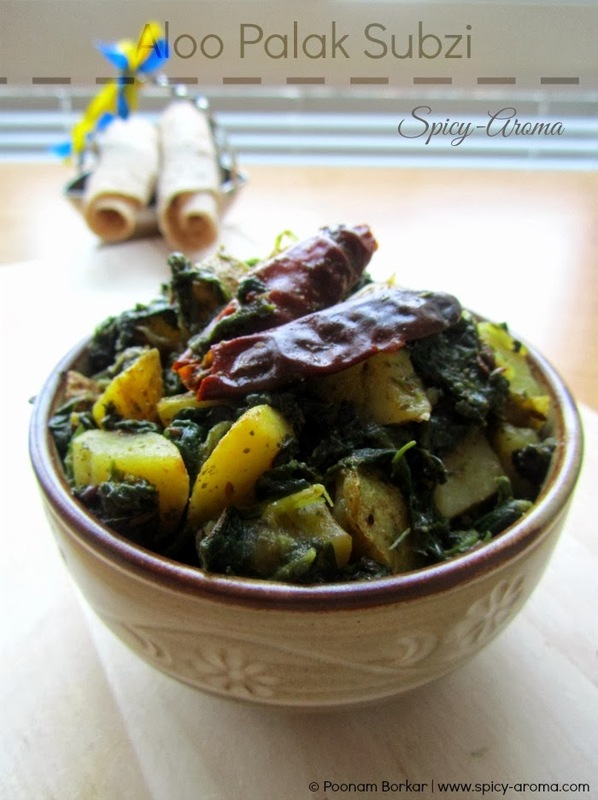 Mix well and cook until all water from spinach evaporates and potatoes cook completely. Do not cover the pan and keep stirring occasionally. When subzi dries out, it is ready to be served. Serve it hot with phulka or chapati. 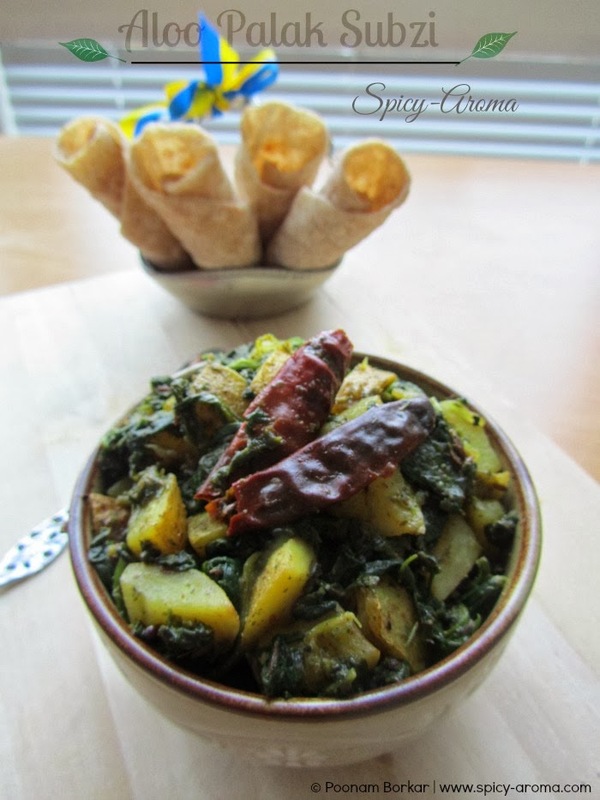 Delicious and lovely to look at Aloo Palak Subzi. Wonderfully prepared.